The book is The Devil’s Cloth: A History of Stripes. I read it back in 2010, but I still think about it often, because it keeps having relevance to me when I research Landsknecht clothing and look at medieval and renaissance art. According to Michel Pastoureau’s The Devil’s Cloth: A History of Stripes, “In Germanic customary law of the early Middle Ages…such attire is imposed on or reserved for bastards, serfs, and the condemned.” Sometimes the hangman or executioner was required to wear an entirely striped set of clothes. In Biblical paintings, sometimes striped clothes are used to indicate the traitor in the Scriptures (Cain, Delilah, Judas, etc.). Sumptuary laws of the time required striped clothing for certain classes of reprobates and outcasts: prostitutes, jugglers, clowns, lepers, cripples, heretics, Jews and other non-Christians. So now when I look at striped clothing in 16th century art, I’m now asking myself, how am I supposed to interpret this person? Are they a Lutheran (a heretic)? Are they an executioner? Are they someone who wants others to see them as someone outside of the social order? When I look at images of Cranach’s martyrdom of Saint Catherine I now see the significance of her executioner not only being a Landsknecht, but wearing stripes. And when I was at The Cloisters and saw the Unicorn Tapestries for the first time, I was squeeing to myself when I saw which members of the hunting party were wearing stripes. It’s important! Having read this book, I’m now better able to understand the subliminal message that these artists are including in their work via their choice to put these men in stripes. I am so far behind. But that’s because this whole blogging to a prompt thing has sent me down memory lane and I’ve been digging through my old (non-digital) photos trying to find pictures of early projects. I still can’t figure out where my “brag book” album has gone and hidden itself. But I don’t want to get too far behind, so time to get posting again! Take us back to where it all began. Oh goodness, I can’t remember a time when I wasn’t in love with playing dress up. We had a dress up box when I was a kid, mostly random long skirts, maybe a cape, and a couple of fabric 19th century bonnets (Little House on the Prairie was on TV during my childhood). My mother sewed, mostly curtains and pillows, but the occasional outfit or costume for me or my sister. And sometimes clothes for my Barbie doll. We had a big wooden wardrobe where she stored the sewing machine and her fabric and the button box! I loved going through our metal cookie tin full of buttons, I suspect most of them came from my grandmother. I was sorely disappointed when my mother told me that she’d sold the button box at a yard sale. I was probably more attached to the button box than I was to anything in my mother’s jewelry box. I took home economics for a single trimester in seventh grade. And I remember that the first outfit that I sewed for myself was when my Dungeons and Dragons group had a little homemade renn faire in our Dungeon Master’s back yard. Now, lest you think I was a completely nerdy child, I’d gone to school with his sister for years, and our group was at least half females. We were NOT the stereotypical “loser” kids that the media liked to portray as playing D&D. We were all super smart, creative kids whose parents were all professionals. As far as I know, we all went off to college and are gainfully employed. Nobody still lives in their parent’s basement. At any rate, we were going to have what I now suppose we’d call a LARP in their back yard when I was in the eighth grade. We all made costumes, and their mom made Kool-Aid and that’s about all I remember about that. I made a t-tunic out of some sort of drab tan/brown fabric with a crenellated dagged hem (which I soon regretted, sewing around all those little rectangles was a real pain!). And I made a red felt hood that went over my shoulders and had a really long liripipe that I had to tuck up in my belt or it would drag on the ground. I was so proud of that hood, I used a drinking glass to trace a scalloped edge around the hem and I made it so that I could wear it as a Chaperon if I wanted to. The tunic has long since disappeared, but I still have the hood in my costume collection to this day. And, as I said in my Introduce Yourself post, my Wasband took me to my first renaissance faire and we used to attend science fiction conventions together, and it was all over once I realized that there were places I could still play dress up as a grown up. In fact I’m going to some sort of costumed event five days this month. My favorite historical era has got to be the 16th century. Even though I’m now a Technical Writer, I studied to be a high school English Teacher in college. Which meant that we studied Shakespeare, and made lesson plans to teach Shakespeare. I’d already been exposed to the Bard when I was a kid, via Classics Illustrated comic books. I had Romeo and Juliet and A Midsummer Night’s Dream in comic book form. But studying Shakespeare and creating lesson plans also meant reading about all things Elizabethan. Because modern students need context in order to understand some of the references when reading Shakespeare. And somehow, falling in love with Elizabethan England led me to renaissance faires, which led me to the Landsknecht. But I spent a LOT of time in England before I discovered the continent and started diving into all things German. I’ve got shelves and shelves of books about Elizabethan costuming. For years, before Devra retired in 2015, I would see Poison Pen Press at Arisia and Birka and Boskone. I would buy whatever costuming books she had that I hadn’t already bought from her the last time I saw her. (And I occasionally slipped up and bought something I already owned, whoopsie!) I got my copies of Herbert Norris’s Tudor Costume and Fashion, Janet Winter’s Elizabethan Costuming, The Medieval Tailor’s Assistant, all my Tudor Tailor books, and all my Janet Arnold books (including Queen Elizabeth’s Wardrobe Unlocked) from her. There is such a wide variety of costumes in the 16th century. We’ve moved from the simple lines of the middle ages, into having more complicated clothes. And clothes that really vary by region. German styles are different from Italian styles are different from English, Dutch, and French styles. I remember reading someone’s costume blog where they said that some busybody had tried to tell them that they’d made a mistake on their Italian Renaissance gown. “That’s because it’s Polish, not Italian.” The person replied. There’s so much going on in both history and fashion, I could never get bored with the 16th century , there’s always more for me to learn about. Ah, extant clothing. Doesn’t everyone have an extant clothing board on Pinterest? No? Just me? OK then. The Extant Garment that I’m currently drooling over (and have been for a couple of years) is the Prince Elector Moritz’s Parade Gown. When I first came across this gown, I could only find black and white images of it. Sadly, the German museums are way behind their English language counterparts when it comes to digitizing their collections and sharing them online. Most of the images that I could find looked like catalog items, and antique catalog entries at that. But luckily, the gown has recently been restored for exhibit, which means that in the past couple of years new images have appeared online for me to drool over. According to the museum site: Reportedly, the majestic yellow-and-black ensemble originally consisted of coat, doublet, breeches and nether hose. The nearly criminological archival research and the consequent diligent preservation restored the status of the gown as an historically authentic costume. So yay for knowing that it’s an authentic piece. During the 19th century, much like the way that there was a revival of interest in medieval and renaissance clothing and culture in England due in part to the Pre-Raphaelite movement, the Germans also had a resurgence in interest in all things Landsknecht. There are 19th century landsknecht paintings, and photographs of historical costume events during what we would call the Victorian era. So there was always the possibility that this was one of those 19th century fancy dress costumes. Just look at how beautiful this is in color. And there is a rather beautiful modern reconstruction of this gown floating around on Pinterest. I found the (German language) dress diary for it here . And I’ve got it pinned on my Beautiful Reenactments and Recreations board. My current project is a tropical weight pink wool gown for my German alter ego, Magdalena von Wissersdorf. She’s a camp follower with the Landsknecht mercenary group Das Geld Fahnlein. A couple of years ago, one of my reenactor friends posted a link that wool was on sale for 50% and I bought some tropical weight wool in hot pink and a sort of bright pea green. It’s been in my stash for so long that I can’t remember which vendor I bought it from, which bums me out, because I really love how it washed up. Pretty much zero shrinkage, and the weight is fabulous! This is my fourth “camp frau” gown. The first attempt was made based off of Reconstructing History pattern #504, 16th century German common woman’s gown. But I didn’t really like the fit, so my second attempt was based off of duct taping myself in a t-shirt and using that as the basis for a pattern. And the third attempt was the same bodice pattern, tweaked again. While my fitting has gotten better with every new gown, this is the first time I’ve had professional help with my pattern drafting. One of our Guild members teaches theatrical costuming at a college in NY, and I drove up last summer to have her help me tweak my bodice pattern yet again. We raised the neckline in the back and significantly changed the armscye. I decided that since I already had a hot pink gollar, that I wanted to make an entire pink outfit based on this woman in the baggage train in the Triumph of Maximilian. I had plenty of other evidence for pink gowns in the German speaking lands during the 16th century, so I wasn’t worried about accuracy of my color choices (I try to follow Kass’s Rule of Three when deciding if something is common enough to reproduce or an outlier). I’ve had the gown done since last summer. But I’m still poking along on finishing the sleeves. I waffled for quite a while on what style I wanted to do. Since this was a tropical weight wool, this was going to be my “summer” gown for hot weather events, which meant I was probably not going to want to be wearing sleeves due to the heat. My friend Dan (from Old New England Grown New) and I have had an ongoing discussion for a couple of years now about whether detachable sleeves are a renaissance faire anachronism or if we could find any documentation for them. Women’s sleeves often have ties (especially the Italians) but mens? Not so much. But I digress, the point is, as much as I loved this gown with short sleeves that I spotted one year at Pennsic, I wanted to do something that I could document. Because Historical Accuracy, that’s why. There are plenty of Italian styles that look like separate upper and bottom sleeves, where the only thing across the elbows are lacing. And my camp follower in the Triumph of Maximilian looks like she has Italian style sleeves. But I wanted a tiny bit more pizzazz if I was just wearing the top part of the sleeves. I finally found this image. I love the devil’s sleeves. And they’re close enough to the Pennsic sleeves that I’m going to use that image to justify my choices. The top of the sleeves (and they’re in progress, but I’m too lazy to dig out the camera, and this post has enough images already) is from the Pennsic gown, pink with a black stripe around the bicep. There will be eyelets and they will lace across the elbows. And the bottoms of the sleeves are similar to the ones in the Triumph of Maximilian, but my striping doesn’t exactly match the image. Once I get the sleeves finished, I’ll probably also add another “guard” or stripe to the skirt and I can call this gown finished. So a friend is doing a sort of Blog along over on Facebook, a solid month of prompts for costume blog posts. This is my “history” blog, but that includes costuming, so we’ll use this month to get me blogging again about clothes, and then I’ll shift back to history (because it will be faire season by then and the Guild with be doing its thing). So, day one is “introduce yourself”. Who am I? I’m a history nerd. I’ve been in love with history, especially historical costume, since I was a little kid. Proof! When I was helping my parents to pack up and move their house, I saved some of my childhood books. These are two of them. I hadn’t quite realized how far back my love of costume went until I saw these again. The Ladybug book is copyright 1965 (I know, I’m dating myself. I R OLD.) and the Instant Picture book is copyright 1967. Although I’m sure we bought it later than that, as I did a really neat job on the transfers. Nobody is upside down or out of place. I loved the middle ages when I was a kid. 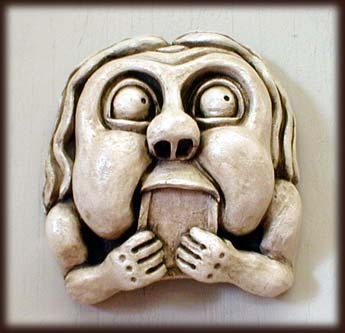 I devoured stories like The Door in the Wall and all the Narnia books. And I loved the clothes. I’ve never been a girly girl, except when it comes to historical clothing. If it’s got complicated underwear, I probably love it! When I was in college, I met my Wasband at a Star Trek convention, and he took me to my first Renaissance Faire (King Richard’s Faire in Carver, MA). I found out that his roommate had made him a smashing set of black and red Elizabethans, so the night before we were supposed to go I hit the fabric store and whipped up a simple T-tunic and cape because I didn’t want to be the only one in our group in a t-shirt and jeans. And I’ve been dressing up and going to faire ever since. That got me started on costuming, and I started sewing my own pieces, as well as buying things at faire. We were also attending Star Trek conventions, so there was some science fiction costuming going on as well. We split up in 2002. And in 2003 I started working faire, as a squire for an armored combat group. And in 2009 we formed a historical reenactment Guild. Since that time I’ve been concentrating less on fantasy type clothes and more on historical costumes. 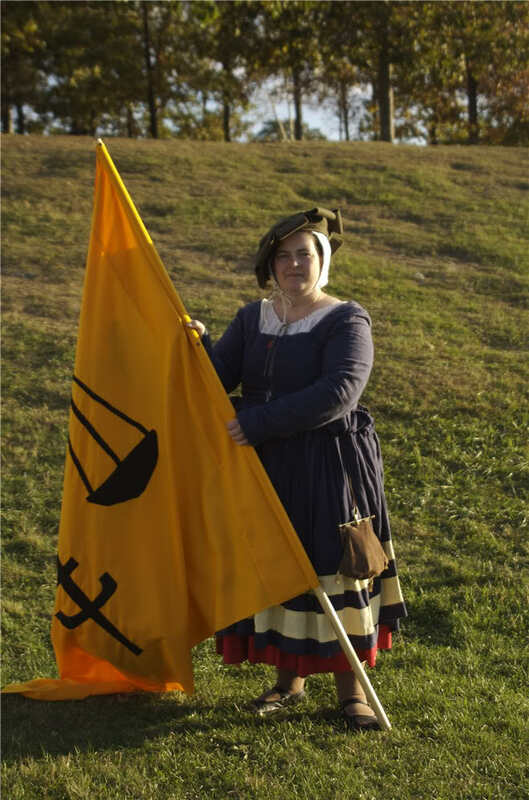 Our reenactment guild focuses on the 16th century Bavaria/ Holy Roman Empire. But I also do a bit of 18th century, 1920s, and I’ve recently added a 19-teens suffragist to my closet. Other than a trimester of home economics in middle school, I’m a self taught sewer. So I probably have all sorts of bad sewing habits. I do try to pick up sewing books at used book stores, which helps when I’m trying to figure out how to do things. And I am the world’s slowest seamstress, so this month will probably be more about what I hope to do than actual progress I’m making on projects. But it will at least get me thinking about sewing and getting back to the project pile, which is better than ignoring the sewing room. 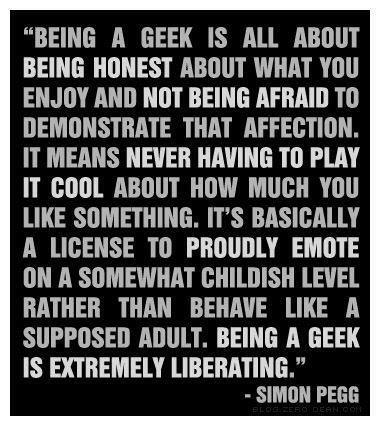 Fly Your Geek Flag Proudly! There’s an article making the rounds on my Facebook feed today, So I’m marrying a reenactor. At least four people I know have posted it and I just saw it posted on another reenactor’s blog. I’d like this article a whole lot better if the first half wasn’t all about how horrified the author was when she found out her crush was a reenactor, and about how ashamed he was about the hobby when on their first date, after four drinks, she blurted out, “Have you ever done reenacting?” “When Daniel confessed, my gut reaction was, FREAK!! !” It annoyed me when the author almost broke her arm patting herself on the back for being broad minded enough to agree to marry “a freaking reenactor.” Describing her lone trip to a renaissance faire as a “freak show” didn’t help my mood either, as she managed to insult two of my favorite weekend activities in a single article. Now I ask you, what is wrong with reenacting? Is there something wrong with learning skills like how to build a fire, tie knots, do woodworking? Is learning to sew/mend your own clothes somehow objectionable? Do people object to learning how to safely handle firearms? (While I’ll admit that I’m not a fan of guns, I heartily approve of firearms education. The one common thread that runs amongst all my friends that I consider to be responsible gun owners? They are all reenactors.) Is spending time outdoors with your friends wrong? Or is it the time spent teaching children (and adults) about history that’s the problem? Maybe it’s the fact that reenactors actually spend time remembering our military veterans, or regularly volunteer to march in Memorial day, Fourth of July, and Veteran’s day parades? Would someone please tell me, what’s so objectionable about reenacting? I’ll tell you what’s wrong with reenacting. NOTHING. I won’t deny that there are probably negative stereotypes about reenactors. My question is, why does the reenacting community allow these stereotypes to continue? Why would you let someone make you feel ashamed about something that you love? Do you know what it’s called when people try to make you feel ashamed about doing or being something that doesn’t harm anyone else? And that’s probably how all this started. At some point in the past, some high school kid probably decided to taunt some other high school kid because they had an interest in history. And because the bully was probably a popular kid and the target was probably a nerdy kid, the mocking spread. I’ve seen it before. It happens to just about any hobby or interest that is even slightly nerdy or geeky. How do I know? I am a geek and a nerd. I am a reeanctor. I attend renaissance faires. I love Star Trek and Star Wars and own costumes for both. Yes, I sew costumes and wear them on days of the year that are not Halloween. I read comic books. I ride a motorcycle. I play with swords. I read fantasy and science fiction. I am college educated. I am overweight. I am a woman. These are all things that someone, at some point, has tried to make me feel ashamed of. And you know what? There’s no reason for me to feel ashamed about any one of them. Maybe it’s because my first experience with shared public geekery was as a member of Star Trek fandom (where William Shatner legitimized bullying Trekkies in his Infamous 1986 Saturday Night Live sketch, something for which I have never forgiven him). Or maybe it’s because the only people who have ever tried to make me feel ashamed about the things I love doing are people that I have come to realize are bullies. Or maybe it’s because I’ve been spending time reading inspirational quotes on Tumblr that remind me to be true to myself, stand up for myself, and be the best person I can be. But any time I see someone duck their head and mumble about a thing they love, it makes me angry. Relevant link -> Contact Hypothesis – The idea that positive personal interactions are one of the most effective ways to overcome prejudice. Now, I can sometimes understand why people make this offer. Some of my friends who work the renaissance faires actually are poor college students. But I’m 47 years old. It’s been a long time since I was a college student. And some of my friends who are performers or self-employed live pretty hand-to-mouth, especially when the economy is bad. But I make good money at my job. I don’t need free admission to events. I can afford to pay my own way in and am happy to do so because it supports institutions that I think are important. Institutions that need to make money to stay open. So why do my friends keep trying to save me money that I’m happy to spend? Don’t they understand that if these events don’t make money, that they will eventually stop happening? Maybe I’m feeling overly sensitive because we just got the news last week that the the Higgins Armory Museum is going to close. And I’m feeling guilty for not renewing my membership and supporting the museum the past couple of years. 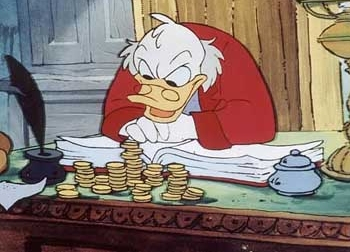 Or maybe it’s because while I was in Williamsburg I picked up a book about the founding and I’ve been reading about how John D. Rockefeller Jr. spent millions of his own money during the Great Depression to create Colonial Williamsburg. Solely because he loved history and thought it was a good idea to try to preserve it. He’s the same guy that built The Cloisters Museum in New York City (I think we would have gotten along famously!). So I’m going to come right out and say it. Reenactors? You guys are penny wise and pound foolish. You pay hundreds, if not thousands of dollars on your kits, but you begrudge historic sites and museums that let you come play on their grounds the price of admission. Admission to a weekend reenactment event is usually very inexpensive. Do you know what it costs to attend a science fiction convention? I’ve seen weekend membership rates that range anywhere from $60 (Arisia) to $200 (WorldCon). And that does not include the price of your hotel room. An annual pass to Jamestown cost me $35. I’ve spent that on a good meal. Heck, I’ve spent that much on a bad meal. An annual pass to Colonial Williamsburg cost me a mere $64. I could spent that in a single trip to the bookstore. I consider the $5 to $15 to get in the gate at most reenactments to be a complete bargain. Seriously folks. Compare the price of admission to what you spent on your kit. How much was the wool for your clothes? How much did you pay for that gown or uniform? How much were those hand made shoes? What did you spend on that sword or rifle? How much for a full suit of armor? Those cooking pots? That tent? How much was your cannon? If you’re doing modern era, what did you pay for that machine gun? The jeep? So why do you begrudge spending the price of a movie ticket to support a historic site? And yet, I’m sure there will be people who will keep trying to get me into events for free. Get a clue people, if you’re at a fundraiser to keep a historic site open, the last thing you should be doing is letting extra people in the back gate for free. You should be encouraging your friends to support the site. Because we want them to stay open. When I first started doing Landsknecht research in 2008 and 2009 I would right-click and save any image that caught my eye. I started with the English language Landsknecht web sites, mostly on the excellent Saint Maximillian web site and exploring the archives for the German Renaissance Costume Yahoo group and going down the rabbit hole clicking links on Wikipedia. But after reading rather widely on the Internet, it started to sink in that Cranach was working in Saxony painting the court ladies, so all those lovely gowns were probably inappropriate for a camp frau from Bavaria. And someone wrote a blog post about how Urs Graf was not only Swiss (and thus sketching Reislaufer and not Landsknecht) but that he was often satirizing the outrageous styles of the time (I’ve tried to track down the blog post, but alas, I can’t remember where I read it). So it didn’t take me long to realize that who the artist was and where they were from might be important information to know when examining period images. And I made the connection that hey, our unit has picked a specific time and a place (1528 Bavaria) and these images I was saving? Probably there were some that were appropriate to our unit and plenty that were not, as styles of dress varied widely across the region. That’s when the research started to get real. I wanted to be able to say for sure if the thing I was documenting was appropriate for our place and time. So I spent the better part of the winter of 2009-2010 going back and revisiting those sites, trying to track down more information about all those random images. I started recording the date, artist, and title in the file name when I saved images. And if I didn’t know that information, I filed the image in a different folder on my hard drive. And didn’t share it with my peers. It was still useful, but not as useful as a fully documented image that I could trace back to a particular date and artist. There’s also the added twist when you’re playing in 16th century Germany of religion, because we’ve got the protestant Reformation going on. And that impacts how artists from various regions depict religious figures. And while portraiture is on the rise, there is still a vast body of religious artwork being produced. And it’s important to keep the religious leanings of the artist in mind when looking at images with a religious or moral theme. Some are the equivalent of today’s political cartoons, where the artist is using exaggeration to make their point. So it’s often useful to know if the artist is from the North (and probably Lutheran) or from the Catholic southern regions (Bavaria is still Catholic). And keep in mind the religious affiliation of your unit and your persona. Wikipedia has been a godsend for tracking down more background information when I only have a name for an artist. Three weeks ago I went to ReenactorFest 9 (OK, technically the name of the event has changed to Military History Fest, but I’m a creature of habit, and it’s still ReenactorFest to me.) One of the panels I attended was Historical Research in the Modern Age given by Antina Richards-Pennock. She talked a lot about Pinterest. Now I’ve been holding off joining Pinterest for months now, because I know how easy it is for me to get lost looking at pretty pictures on the Internet. But when one of my costuming friends shared the news last Tuesday that they’d created a board for leopard prints in 18th century clothing, I broke down and created an account to follow her. Of course, my very first search term was “Landsknecht.” Since I had a bunch of other things to do that night, I didn’t allow myself more than 10 – 15 minutes to poke around. But it didn’t take me long to find one of my own photos, pinned on someone else’s board. Then I found a pattern that looked suspiciously familiar. I clicked it to take a closer look, and yes, it was the hemd pattern layout that one of our members had shared last year. So now I knew that “Ilsa” was on Pinterest. I also found a ton of pictures of Landsknecht reenactors, both good and bad. After spending so much time looking at period source images, I’ve picked up more about costuming than I’d realized. I also learned a new Google Images trick from that research panel. I’d heard that you could use Google Images to search for matches to an existing image, but I was fuzzy on the details of how to do it. She demonstrated how you can drag an image off your hard drive and into the search box. Cool! I know this is going to be useful in trying to track down those mystery images where I don’t yet know artist and date and title. Although I’ve already tried with one of two that I’m most desperate to track down provenance for, and so far all I’ve found is various blogs reposting the same images. Eventually I will track them back to their museum origins. Which brings me back to Pinterest. I’ve started creating boards (You can find me at http://pinterest.com/fraumagda/) but I’m going to try to go slowly at adding new images. My goal is to only pin or re-pin material where I know the date and artist of the image, and if possible the title of the work. And hopefuly the museum that holds the piece. Because, depending on the museum, that may link you to a high resolution image where you can zoom in to see details. But it’s going to be hard to restrain myself, as there are so many wonderful images already pinned! And tracking down sources can be difficult and time consuming. But I’ll take the time, because it’s not good research material if you don’t know where it came from. A couple of weeks ago I went to my eighth ReenactorFest. (Well, it’s called Military History Fest now, but as a non-combatant, I like the old name better…) One of the great things about ReenactorFest is getting to cross-pollinate with other reenactors. I’m particularly grateful that I’ve gotten to meet Bob Charron, because the man just blows my mind. So part of the reason why I’m thinking about Bob is precisely because he felt that the best way to fully understand a medieval/renaissance manuscript was to understand all the things that a medieval scholar would have known. I have spent the past couple of winters trying to get inside my Bavarian alter-ego’s head. Magda lived during a period of religious upheaval that we now call the Reformation. So I think a solid understanding of both the Catholic faith and the heretics that came to be known as Lutherans and Calvinists is necessary if I’m to understand not only Magda, but the times in which she lived. But one of the hardest things for me about playing Magda is probably her Catholicism. I was raised somewhat agnostic. My parents never took our family to church, although I have attended services with friends. At various times in my life I’ve self-identified as agnostic, Unitarian Universalist, and pagan. The issue is that I don’t feel like I know nearly enough about Christianity in general, and Medieval Catholicism in particular, to fully understand either Magda or the upheaval that was the Protestant Reformation. So this Lenten season, I’m buckling down and trying to make a serious dent in the pile of books I’ve acquired on medieval diet (since we’re talking Lent) and medieval saints and relics, which are my two main areas of interest. In addition, I’ll probably be doing some other research, perhaps attending a Catholic Mass in Latin. I’m also giving up Sloth and Gluttony. Because it’s not Lent if you’re not giving up something you enjoy.